At Heinlein Beeler Mingace & Heineman, P.C. our team of experienced litigators stands ready to represent you in the aftermath of serious injuries caused by the negligence of others. Our attorneys litigate a high percentage of our personal injury claims. We do not settle for less than fair compensation for our clients. Attorney colleagues refer clients to our firm. We have the resources available to hire the experts that are necessary to advance your case. These experts include medical professionals, product specialists, accident reconstructionists, engineers, economists, and forensic experts. Our attorneys work with our clients in a team effort. We believe you are an integral component to your case. Contact us to arrange a free initial consultation. During this consultation, we evaluate the merits of your claims. Personal injury fees are usually contingent upon recovery. This allows injured people access to the justice system. Commercial litigation fees vary from standard hourly rates to flat fee arrangements depending on the specifics of the case. 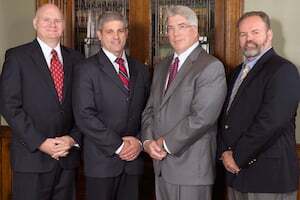 David W. Heinlein, Jeffrey S. Beeler, Christopher H. Mingace and Michael J. Heineman are the principal attorneys at our firm. Additionally, Attorney Timothy J. Bradl is Of Counsel to the firm. Attorney Bradl is a former Assistant District Attorney for Suffolk County in Boston, where his primary responsibilities included investigating and prosecuting murder cases for the Suffolk County District Attorney's Homicide Unit. Now in private criminal defense practice, Attorney Bradl handles cases and trials throughout Massachusetts. Our firm represents individuals, families, and businesses in the areas of personal injury and commercial litigation. Contact our firm to learn more.